Organizations looking to develop a versatile and adaptive workforce require a blueprint. 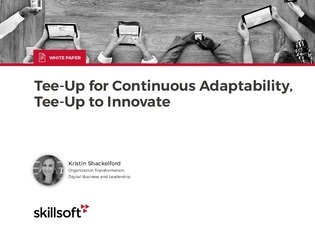 In this white paper, discover how a T-shaped employee development model can help organizations tap into their employee’s potential, and solve for the growing challenges related to workforce mobility and sustainability. To learn how a T-shaped employee development model can help empower your workforce, download this white paper, and discover why organizations who employ a T-shaped model have an easier time adapting and innovating for the future.